One of the coolest things about living in New York is being able to walk down five blocks, meet up with your friend, walk some more blocks to a new restaurant, have a decent meal and a great glass of wine, walk a couple more blocks and see a terrific play with some really terrific BROADWAY actors for $18 bucks in a tiny theatre with less than 75 people. That's what we did last night and it was Jeffrey Sweet's play Flyovers. While we waited in a tiny foyer at the top of a very long flight of stairs to go into the house, Richard Kind walked in and chatted with friends. He was happy that he lived just around the corner. Michele Pawk was waiting around too. For the second row in a week, I saw a play that I really want to read. That's a good sign to me - I want to relive the words and catch things I might have missed. It's a sharp, funny story that has me laughing and thinking and loving it all at once. This one's about a New Yorker who returns to Ohio for his high school reunion. He reunites with a couple of rough characters who didn't treat him so well back in the days. Kevin Geer played one of the rough ones and his wife is played by Donna Bullock. Donna's role is a brief one, but affective. Kevin's character is sleezy and funny, but sympathetic. 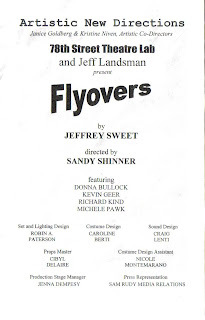 Flyovers is humorous and intelligent, with some really unexpected twists and turns. Just when I thought it was going to be cliche, there was a sharp turn that brought down the house. It had us shocked and holding our sides all at once. I love Michelle Pawk in anything she does - she's so damn funny with that smokey voice and even smokier look. The play is full of really dry wit and sarcasm, which I love. At one point, one of the best lines delivered by Richard, the playwright was perched on the riser next to me and he was laughing as hard as I was. It much be a thrill to hear your words delivered to a room that eats it up and has you laughing too. To me, that speaks volumes. Flyovers runs through February 15th. The play is published in "Victory Gardens Theater Presents: Seven New Plays from the Playwrights Ensemble" published by Northwestern University Press.